Crispy, crunchy and perfect for dipping! These Keto low carb tortilla chips taste just as good as the real thing, but with a fraction of the carbs. Great for nachos!! I don’t really have a sweet tooth. I have a salty tooth. Don’t get me wrong. 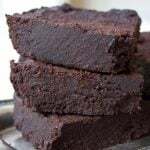 Desserts are great, especially anything that contains dark chocolate, like these Keto brownies. But something that’s salty and crispy? Goosebumps all over, razor-sharp focus. Get it, hog it, eat it. It’s like a primal instinct. Pre-low carb, I was a big Dorito fan. When we had a bag around the house, I’d make sure nobody else would find it. It was just too precious to share! I don’t really want to go into detail about all the bad stuff that make Doritos taste so good, from evil artificial flavourings to inflammatory vegetable oils to sugar (!!! ), and ruin some great memories. It would be absolutely lovely if processed foods would nourish our bodies and help us look younger every day. This recipe is an adaptation of the wildly popular Fat Head dough – you can read all about its origins in my post about these grain free pretzels. Fat Head dough uses mozzarella as a base, which, together with a nut flour such as almond or coconut, produces an absolutely delicious and versatile dough. 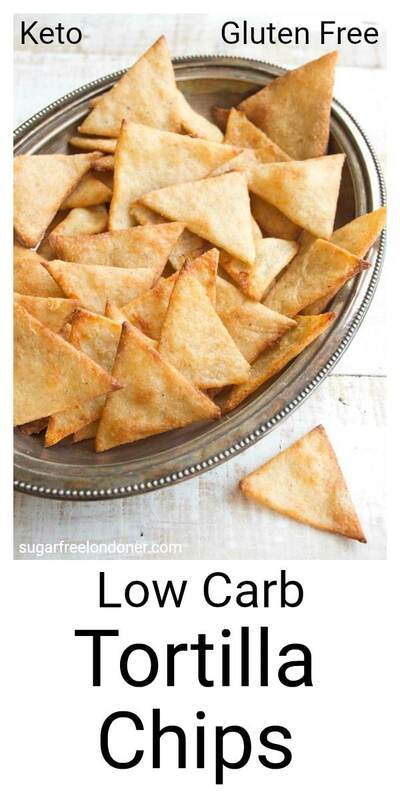 The secret to successful low carb tortilla chips is to roll the dough out SUPER-THIN. Roll it, check it, and when you think you’re finished, roll it some more. If your dough is not thin, your tortilla chips won’t be as crispy. I’ve added psyllium husks, which helps bind the dough together and makes the chips crispier. What is the difference between psyllium husks and psyllium husk powder? Psyllium husks look like tiny sticks – kind of like a coarse powder. Psyllium husk powder is very, very finely ground and twice as absorbent. If you choose to use psyllium powder, make sure you use no more than 2 tsp or the dough will become too firm. Expert tip: Roll the dough out between 2 sheets of baking paper. It makes life so much easier because nothing can stick! 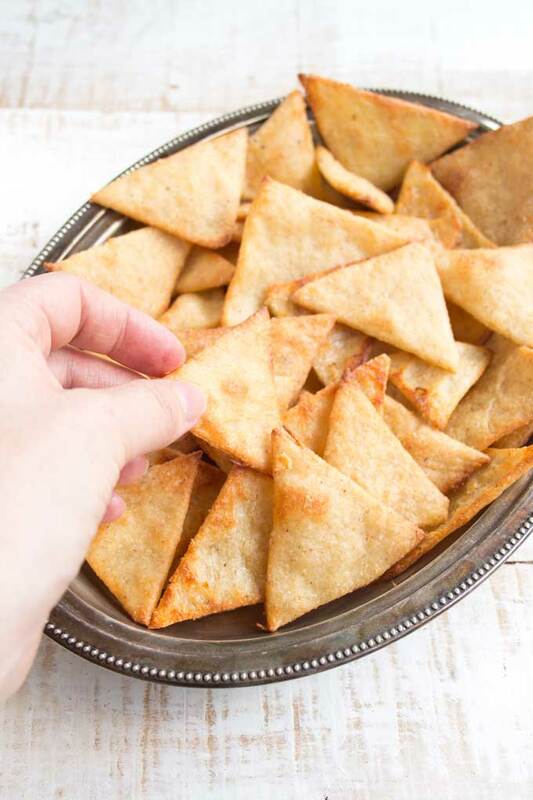 Keto tortilla chips aren’t just as good as Doritos. They actually taste BETTER! They are deliciously crispy, cheesy-spicy (you can adjust the spices to taste – even only a pinch of salt works) and an absolute dream with guacamole. Next time, I want to use them to make a loaded nachos platter. I’m salivating just thinking about it! Tried this recipe? Give it a star rating below! Heat your oven to 180 Celsius / 356 Fahreheit. Melt the mozzarella in the microwave (ca 90 sec-2 min). Alternatively, heat gently in a non-stick pot. Add the almond flour/ground almonds and psyllium husk plus the salt and spices, if using. Stir until combined, then knead until you have a smooth dough. Separate the dough into 2 balls and roll out between 2 sheets of baking/parchment paper. Roll out as thinly as possible! 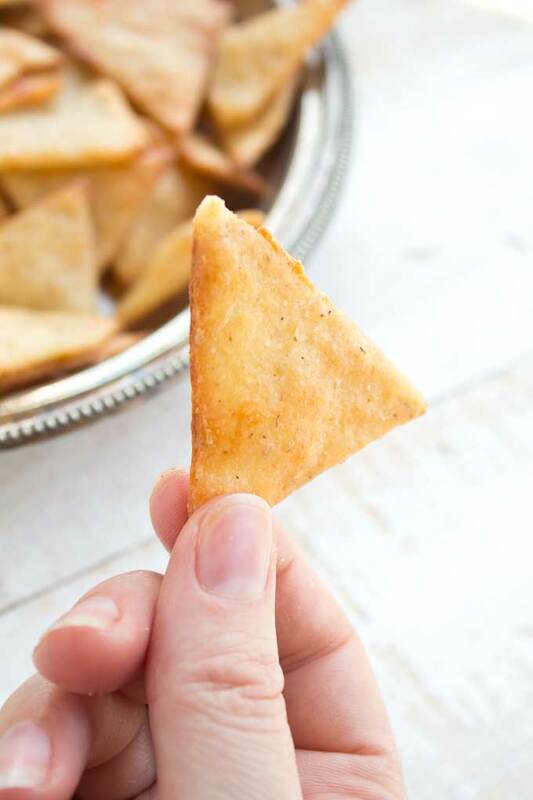 The thinner, the crispier your tortilla chips will turn out. 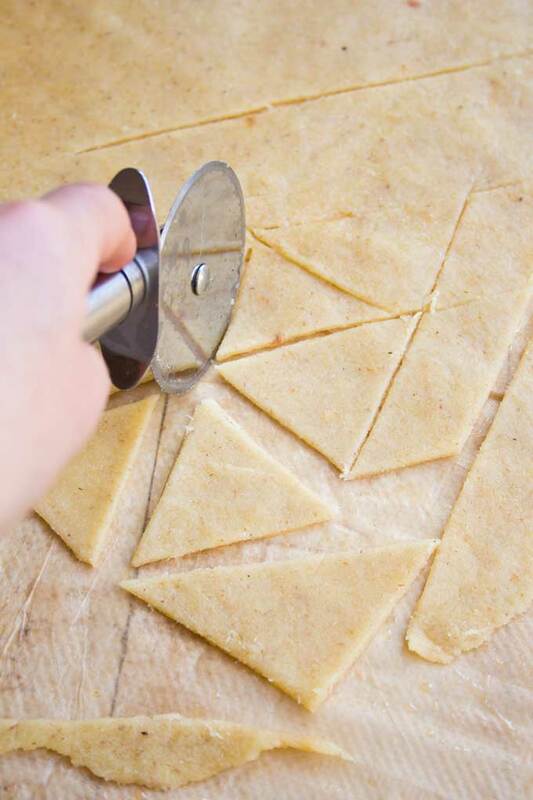 Cut into triangles (I used a pizza cutter) and spread out on a sheet of baking paper so the tortilla chips don't touch. Bake 6-8 minutes or until browned on the edges. 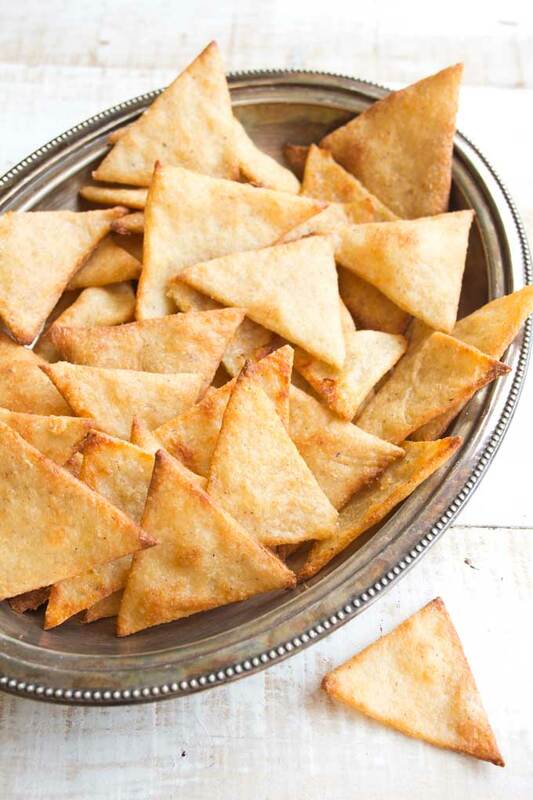 Baking time will depend on the thickness of your tortilla chips. I baked mine in 2 rounds, plus a third round for the off-cuts. My tortilla chips weighed around 5-8 grams each and the batch made around 40 chips. I'd say if you have a couple of dips, they would be enough for 8 people as a nibble/appetizer (or 4 people if it's more the main attraction of the evening). Nutrition is calculated on the basis of 8 servings (5 tortilla chips per serving). 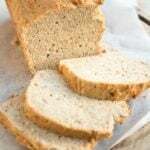 If you don't have psyllium husk, use 2 more tbsp of almond flour instead. 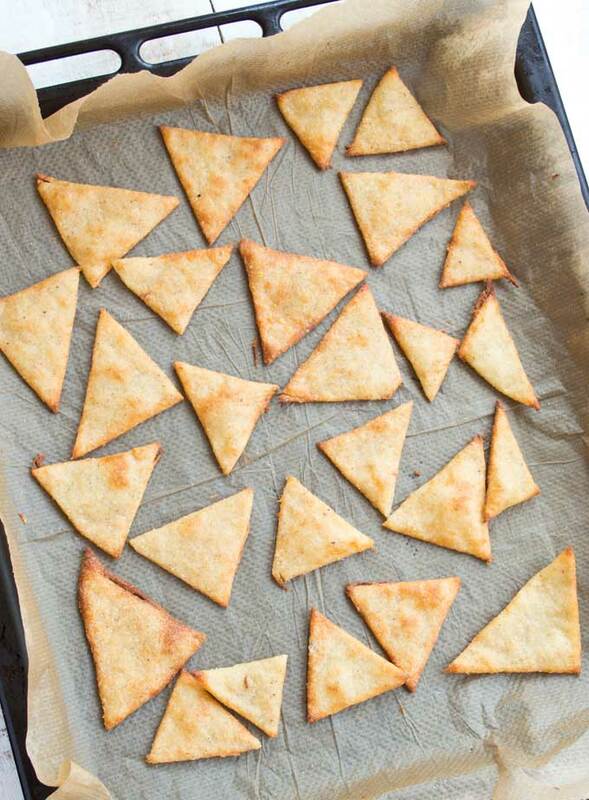 UPDATE >> A reader who made these pre-cut the tortilla chips, but did not separate them by hand. They separated on their own whilst in the oven. I have not tried this myself yet, but will do when I make my next batch! This post contains affiliate links. If you click on one of these links and purchase a product as a result, I may earn a small commission. This money goes towards the running costs of this website. Thank you for supporting Sugar Free Londoner. I cannot find a way to make a separate comment but wondering how cream cheese would work? And then adding cinnamon to the top when baking? Hi Val, if you added cream cheese, you dough would become softer. And if you add cinnamon and a bit of sweetness that would be nice. Check out my Keto cinnamon rolls – I think you would like them. Oh my…I think I love you! These are out the oven as i type. Made as per your recepie rolled thinly and five mins in oven. Perfectly perfect in every way. Now I will not be the only one sitting round the campfire without nibbles. Thank you. I may have missed it but how many chips can you have In a serving? I calculated the nutrition on the basis of 8 servings = 5 chips per serving. But of course, it all depends on how large your chips are. Could I use xantham gum in place of the psyllium or just do the dtra almound flour as you mentioned? 2 tbsp of xanthan gum seems like a lot to me for this recipe, though I think one reader commented that she had done that and it worked. I’d try maybe 1 tbsp xanthan and one additional tbsp almond flour. This was by far the most difficult thing I’ve ever done in my entire life I will never make these ever again I am pretty sure that everyone in my apartment complex things that I was being brutally murdered by how angered I was trying to make these little chips. And then I finally got some of them and they weren’t even worth it so I really would love to know whoever can make these and have you come to my home or even deliver them in the mail either way I will pay you as much money as exists in the world for you to make these for me so that I can eat chips again because it is completely difficult and way far out of my ability and I can cook some things for sure but this is just not one of them. Oh dear this sounds like you did not have a good time making these at all! What was the problem? Did you have trouble rolling out the dough? I”d love to help you out, because we all deserve chips!! Idk how but I completely failed it. The “dough” was too hard to roll. And it was a big thickness. Hi Kelsey, this sounds like your mozzarella was too cold. Next time, re-heat it a bit if this happens. Then rolling it out thinly will become easier. Hope you’ll give it another go. do The left over chips need to be refrigerated or can I just put them in a bag and store on the counter? They’re fine on the counter for a couple of days. My wife is allergic to tree nuts :(. 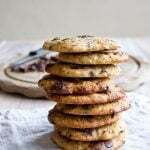 So what are some alternatives to almond flour??? 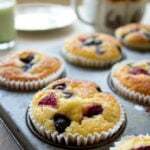 Coconut flour is the most popular alternative to almond flour. You need to reduce the amount though to 1/3 – 1/2 the amount stated for almond flour as it absorbs more liquid. So, just to make sure- 5 chips are approximately 2 net carbs? I would think maybe 10 to 15 would be more what a serving would be. But basically checking that they are 2 net carbs per 5. Thank you. Hi Karen, yes, that’s what my nutritional calculation came up with. This may differ slightly depending on the mozzarella used. How melted do you let the cheese get in the microwave? My dough was pretty “gummy” so it was hard to roll out. Which lead to the pieces being chewy not crunchy. It’s hot and very soft when I take it out, so the other ingredients are easy to stir in. Then, once everything is combined, it’s cool enough to be kneaded by hand. Sounds like you can try to heat the mozzarella a bit longer next time. Hi, how many minutes for the microwave. I am going to make these either tonight or tomorrow. I am new to Keto. Thanks. Hi Cherie, zap it in 30 second bursts. It should take 90 seconds – 2 minutes. Can you use mozzarella that you shredded yourself or does it have to be preshredded..? I think in some countries you can buy firm mozzarella that you can shred yourself, it should be slightly yellowish in colour and come in a block like hard cheese. You cannot use the white soft mozzarella you can buy in pouches surrounded by liquid – the one you’d use for salad. That one contains too much liquid to work in this recipe. How many chips equals 4.8 carbs? 5 chips equal 4.8 total carbs and 1.9 net carbs. Could these be baked in an air fryer? I have had such good luck with mine! I want to try this recipe out, but would love to see how they do in the air fryer. Anyone know? Just made these a second time using all the tips…3 balls instead of 2 dough balls and cut and baked them on the cookie sheet. I found mine did not desperate muchand I had to pull them apart because the ones in the edges were done but inner ones not done. They are fabulous though and nice and crispy! OMG. They are so good. I didn’t use the Psyllium Husk as I didn’t have any, but it worked out great. I also added Seasoning Salt. So good with Salsa or Cream Cheese. Thank you for the recipe. Hi Katrin. Love this recipe. Thanks for sharing. I missed having savoury chips , so this recipe was really handy! We finished it in 1 afternoon tea, with my non keto friends. I really want to make these but I am vegan. Any substitute that you know of that I could use for the Mozzarella? Also, I have no psyllium. I do have flax and hemp seeds. Would hemp work? I prefer it to flax. Hi Heather, I don’t have much experience with vegan cheeses. I have tried a cheddar flavoured vegan cheese which was made from coconut oil, but I found that it did not melt as well as mozzarella. I’m sure though there are differences from band to brand. If you know of a vegan cheese that does melt well, use that and see how you get on. I’d use less almond flour to start with, just in case, so you can roll it out (assuming that your cheese may not become as stringy as mozzarella). As for the hemp – again, I have never used ground hemp seeds! As there is no difference in texture though I’d say hemp would work just as well as flax. I’d be so interested in hearing how you get on! Will you let me know if you give it a go? would I use ground hemp or just whole hemp seeds? Your recipe calls for whole flax seeds, correct? No, it calls for either psyllium husks, which are similar in texture to ground flaxseed, or psyllium husk powder. Don’t use whole hemp seeds. Definitely use ground. Just wondering how long these would keep in the fridge? I was thinking this would be great with some turkey taco meat for a meal prep. I’m sure they keep a good few days. They may lose a bit of crisp though. Are you weighting the chips prior to baking or after? Are the 5-8 grams per chip raw or cooked ? A++! I made these tonight and wow! I’ve missed having something carb friendly to dip with! I used the course almond flour which added a nice color and texture as well! I struggled a bit to roll them thin enough so they didn’t crisp up as much as I would have liked but will try to heat the dough a bit next time. Regardless these will be a staple in my diet!!! I made this morning for the Super Bowl tonight. They are so good, I can hardly stay out of them! So nice to have a chip I can eat. Thank you so much! Can you substitute something for the psyllium husk because I don’t have any. 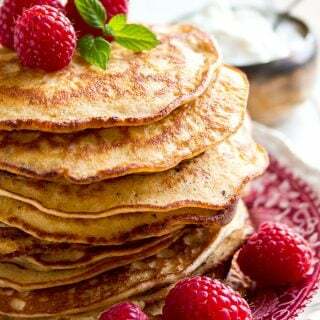 You could either add more almond flour or try using flaxmeal instead. I don’t have any Husk powder. I have flax seed or xanthym gum. Can I make with out or use one of these to substitute? I’d try with the flaxseed over the xanthan gum. It’s about making it a bit crunchier. 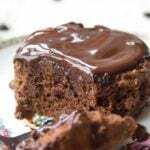 I have to say though, psyllium is a great ingredient for low carb baking – get a pack if you can! Hello!! Thank you for the idea!! I don’t have the Psyllium powder can I just not use it if I have the other ingredients? The psyllium does help with the crunch and I think it also helps when rolling out the dough. Maybe you could use almond flour instead? But in theory the recipe would still work without- let me know your findings, I’d be very interested to hear. I was wondering if you could put the dough through a pasta machine to get the chips really thin. What do you think??? I don’t have a pasta machine, so I’m not sure. I’m wondering if it would stick to the machine though. I always roll out under parchment paper so I don’t have that problem. What I can say though is if you do try, wait until the dough has cooled down because it’s a lot less sticky when cool. I made these with the psyllium husk powder and they came out purple! Can you tell me why ? Yours are so pretty! Hello and thank you for an awesome recipe. I made the crispy and chewy versions using half of the dough for each one. Next time I will use the crispy crackers for nachos. It was tasty, next time I will add a half more of the seasonings. 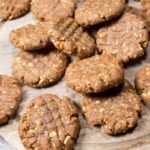 This recipe really feels that need to have something crunchy while maintaining a Keto food lifestyle. When I tried to add this to myfitnesspal the nutrients are way different from your can you tell me why that might be? Hi Stephanie, I use a free online calculator on a website called sparkrecipes. You can check it out. I fill in the nutrition for the ingredients I use and run it through their tool. Nutrition can differ from brand to brand, but only slightly. What’s the macro you are getting different results for? I do not like the psyllium. 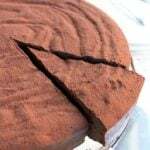 Is it possible to replace with xanthan gum? How much arrowroot powder would you use? I don’t have much experience with arrowroot powder. Looking at other recipes that use it, I would go with the same amount. It is my best guess though, so I can’t guarantee it’ll work as well as the psyllium. My family loves these even though I did not roll them thin enough. This was my first recipe using psyllium husk….and I am wondering the obvious??? Is it enough to give loose bowels? ( diarrhea) ?? This recipe is great! I added 2 tsp oat fiber as well, and the flavor and texture is perfect. Question: if making to keep chips on hand and not eating them all right away, what do you recommend for storage? Would they get soft if I store them in ziplock bags? So you have to use pre shredded mozzarella, or can I shred a block that I have? I’ve never seen a mozzarella block that has the same texture of shredded mozzarella. Here in the UK the mozzarella that comes in a log is normally white, quite soft and stored in liquid. It’s great for salads, but contains too much moisture. THe shredded mozzarella is dry and a light yellow. That’s what you need for this recipe. In Canada we can buy it in a block or round blob. It’s much more firm and dry compared to the kind stored in liquid. It works just as well as the prestressed kind. If you can grate it ad it’s not wet, it should work! Maybe after baking if they’re not crisp enough you could toss them in the dehydrator? I don’t have a dehydrator (it WAS on my Christmas list, but then I forgot to buy myself one :)), but it sounds like a plan!! So here’s why I just discovered. I just made a batch of these. I rolled out the dough really thin, used a pizza cutter to cut the shapes, but I did NOT separate them. I just left it all in one big sheet with the lines cut all through it. About half way through baking, the shapes started separating all on their own. No need to separate them and place them individually on the baking sheet. They all separated on their own with about an eight inch between each chip. I should mention, I did bake it on a sil-mat baking sheet, so not sure if that made any difference. I think because mozzarella has so much oil in it, and they tend to puff slightly, they just easily separate by themselves. Just thought I’d throw this out there. I also didn’t use psyllium powder. I used the same amount of flaxseed meal instead. I think I’m going to make a second batch now using the psyllium husk powder and compare the taste and texture of the two. Thank you Ryan, I’ll put this in the recipe as a tip. Good to know!!! Hello, if I use coconut flour, will I use the same amount as the almond flour? If I don’t have the psyllium husks also, do I add more coconut flour? I made 1/2 batch of this recipe and still got 40 tortilla chips! The dough was so thin it was translucent. The chips are cooling on a rack but I snuck one and it was so good! I am a huge fan of mozzarella/almond flour doughs and made a batch yesterday for baked brie, which is sitting in the fridge waiting to get baked. I’m trying to get as much staged for New Year’s Eve dinner. The tortilla chips are for anytime, but I might make a spinach artichoke dip just for fun. 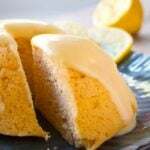 I’m always online looking for recipes that will keep my keto lifestyle interesting, and this site was a BIG help. Great choice for NYE!! A spinach artichoke dip….. sounds so good 🙂 Happy new year! While these were tasty, I don’t know how you got them crispy. I made them as thin as I could baked them until they were very brown, but they didn’t crisp up. 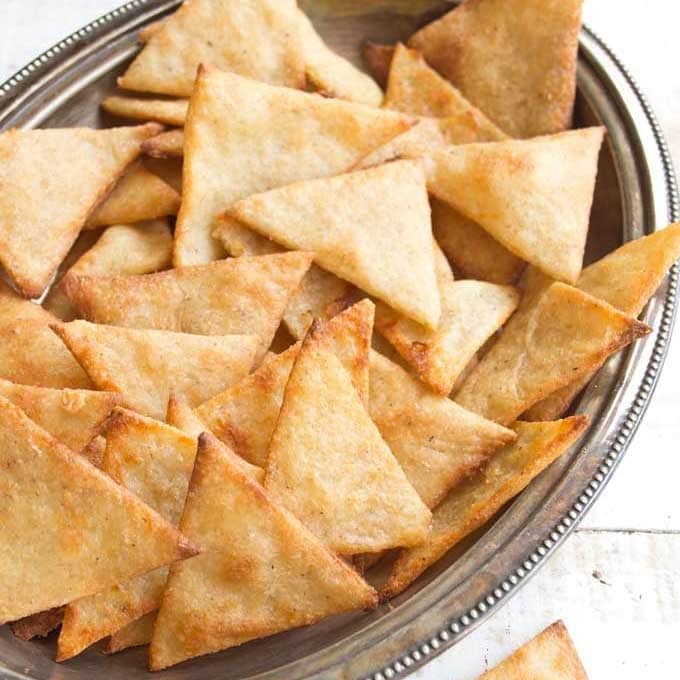 I’m thinking a recipe I have for keto crackers would be better as a chip for dipping because they are definitely crunchy. Just wanted to let you know the link to the psyllium husks is no longer active. Hi Vicky, thanks for the heads up – I have updated the link. I love these and totally agree with continuing to roll the dough out until really thin. I cut the dough with a pizza roller but didn’t separate the triangles. Once baked, since they were nicely scored, I just snapped them into pieces. Unfortunately I ran out of room on my cookie sheets but the edges were very thin & perfectly crisp. Next time I’ll divide the dough into 3 balls so I can keep rolling & not run out of room. 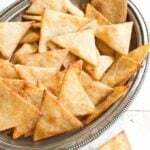 Excellent recipe, thin, thin, thin is the way to go for crispy ones but thicker makes a sort of chewy on the inside, crispy on the outside snack which is lovely in it’s own way. I tried sprinkling them with ‘sour cream and chive’ flavouring which I keep for dehydrated veg crisps. Simple to make – 2 x tbsp dried milk powder, 1 x tbsp onion powder, 2 x tsp powdered sweetener (erithritol), 2 x tsp garlic powder, 1 x tsp dried parsley or chives and 1 x tsp salt – mix together and shake over. Thanks for sharing the sour cream and chive flavouring, I MUST TRY THAT!! So I can make these ahead of my Christmas company do they freeze well and stay crispy? Maybe reheat? Gosh, I really need an air fryer!!!!!! Delicious crunch! I split the dough and made half with rosemary and the other with everything seasoning. Is psyllium husk gluten free? Psyllium is classified as a seed, not a grain and therefore is gluten free. Yes, I think that could work – it’s a recommended substitute for psyllium. I have not tried it in this recipe though. Let me know how you get on in the comments! First and foremost these taste delicious!! Mine turned out puffy though, not flat. Is this normal sometimes? I used 1/4 cut of coconut flour instead of the almond flour, mostly because I am a teacher and we have a nut-free school. I will still be eating them but I’m wondering what I could do differently!?! 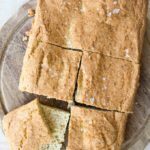 I know this recipe has been here a while but I just got into LC and found it in my search for some decent crackers. I have tried so many cracker recipes and they have all been bendy rather than crisp and just too eggy etc. I just tried your’s and hallelujah they came out crisp and absolutely delicious. I never comment on anything online but I decided I just had to to thank you for ensuring that I can finally stop the food waste as I have found my forever crackers. Can I use pre shredded marble cheese? I have tons of that right now. hi Jennifer, I’m not sure what that is! Is it a bit like cheddar? You’d have to experiment. What I can say though is that mozzarella behaves differently to cheddar or gouda when it melts, for example. It is more stretchy and becomes less liquid. Try it out with your cheese, maybe make half a portion, and see if it works! Really good! I only had Colby jack and I added some chili powder and cayenne so they would compliment my chili, turned out delish. Thanks for the recipe! Glad you like the recipe! Can we get all the macros? I see the carb grams bot not sure about the fat and protein grams? My son just tagged me in a delicious looking pinwheels recipe. Would this dough, without the spices you mentioned, work as a regular dessert dough, or even a pie crust? Just for confirmation, are you saying for every 5 chips, it is 4.9 carbs? Or is it 4.9 carbs for every 8 servings? I was just a bit confused on the phrasing. Hi Josh, it’s 4.8g total carbs per serving of 5 chips (=1/8 of the recipe), minus the 2.9g fibre, so 1.9g net carbs per 5 chips. Can this recipe be used to make soft tortillas or wraps? This sounds like it would taste so good with fajitas if it’s possible. Thanks. Hi Michael, try these low carb wraps. They make great soft tortillas. Can I use anything other than pysillium husk? It does not agree with my tummy. You could try using flaxseed meal instead. It’s the closest replacement I can think of. I haven’t tried using it in this recipe. I only ever use it in tiny amounts. Made these! They’re wonderful! I made a huge batch and put ¾ in the freezer and am taking them out to munch on in lots and they’re perfect that way – still super crunchy and delicious! Thank you so much for yet another wonderful recipe! Brilliant! It’s always awesome to have a goodie in the freezer 🙂 Thank you for your kind words! How many days are they good for in a ziplock bag? Can I refrigerate to lengthen the days? Thank you so much for this recipe!!! Omg. Just made these and had with salsa and homemade guacamole. So good. I ate the whole batch in one day..
Do you think you can make the dough and form the chips but freeze them before you cook them? This way you can pull them out and bake when you get that craving? Yes, I think that would work. And then straight in the oven and increase the baking time accordingly. Wonderful! Going to try and reheat in the air fryer for the next day to recrisp! All I can say is it’s VERY hard to eat 1 serving. Very good recipe . Will definitely be making again. Thank you for sharing this Katrin. I think this recipe will become an instant favourite based on the frequency that we have nachos in my household. Any way to store these and at the same time, keep them Crispy? They tend to go a bit chewy. Mine stayed on the counter for a day and they were a tad less crispy the next day, but not chewy – still very enjoyable. I guess the sensible way is an air tight tin. The easiest way to really crisp them up would be to stick them back in the oven for a couple of minutes. I wonder what would happen if you put them in the microwave 30 seconds, as that also reduces moisture. Might be worth an experiment. Thank you, thank you! I, too, love Doritos. I want to try these – and soon! 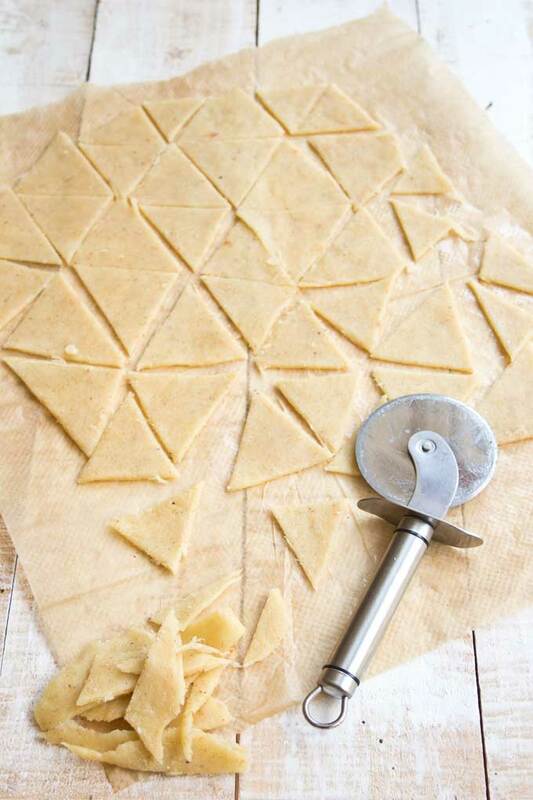 Do you think you could use a pasta machine to make it thin…maybe try rolling it in between parchment paper? These sound amazing! I have an almound allergy. Could I use Coconut flour instead? Of course! just change the quantities because coconut flour absorbs more liquid. I’d try it with less coconut flour though – 1/4 cup is probably enough, 1/3 cup at the most. I used coconut flour in my recipe for low carb pizza and it works really well. Thank you so much for this wonderful recipe!! Served them at my book club last night with a couple of dips and they went down a storm. Like you say, you need a bit of patience to roll out the dough just right but it’s so worth it. Crispy and delicious. Great! Let me know what you think once you’ve tried them! Yes, add me to your mailing list and send me a free ebook! Yes, send me regular newsletters and my freebie!